UN security council permanent member gk trick to keep in mind easily forever so that they can go with high confidence in exam. Permanent members of United Nations Security Councils were allies of World war 2 of winning side. Only these 5 permanent members have Veto Power, which enables them to prevent the adoption of any “substantive” draft Council resolution, regardless of it’s level of international support. G.K Trick-:Run For Chase Usain Ustad. 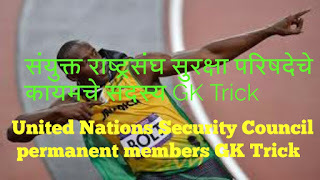 So, How was UN security council permanent members gk trick For more G.K Tricks Follow us on blogger & also subscribe ‘Vikasanshil’ YouTube channel.